If you've ever wanted to know more about the backstory of EVE, don't bother reading those EVE novels. Don't read the lore posts or the explanations given by mission NPCs. Instead, ask an Agent of the New Order! In the content vacuum of today's EVE, the New Order writes the stories. 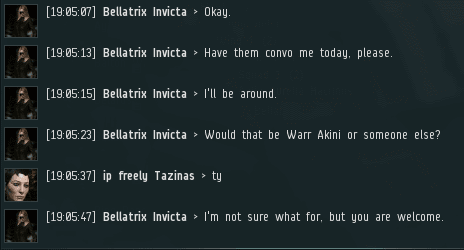 Newbie miner ip freely Tazinas innocently approached Agent Bellatrix Invicta to learn about EVE. Bellatrix did her duty well. 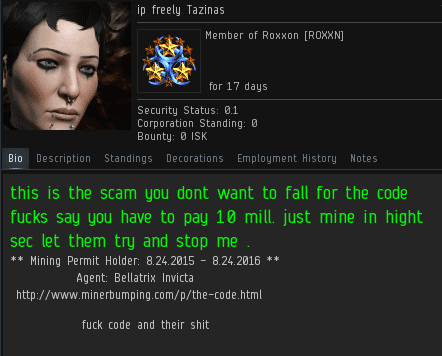 Not only did she demand 10 million isk from the miner, she told him why she was demanding it. ip freely struggled to understand. Obviously, she wasn't a good player--it was difficult to get her excited about buying a permit. If this blog had sound effects, dramatic music would be inserted here. The miner revealed that she wasn't a new player at all. She was the alt of someone dangerous! The highsec miner's true form was unveiled. 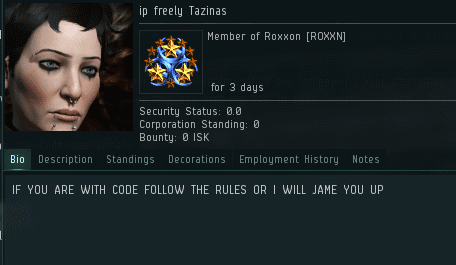 It was a shocking revelation--ip freely Tazinas was actually a leader of the Goonswarm Federation alliance! As every good conspiracy theorist knows, the New Order and the Goons/TEST/PL/etc. are one and the same. As further evidence of this, Agent Bellatrix wasn't intimidated by Goonswarm in the slightest. She probably has tea with The Mittani between ganks! ip freely quickly terminated the convo. A few minutes later, another hair-raising twist came by EVEmail. "GoonSwarm leader" wasn't even ip freely's final form. Now she had power over CCP itself. ...It was ip freely's most hideous form yet. The monster could barely get a sentence out. The twisted creature had clearly sold her soul for power. She was as corrupted on the outside as she was on the inside. Bellatrix could hardly stand to look upon her. The horrors of ip freely Tazinas were reflected in her bio. And it only got worse. People say highsec is all sunshine and rainbows now that the New Order is in charge. It's true that sunshine and rainbows are far more abundant now than ever before, but abominations still lurk in highsec. Always be on your guard. If you encounter something that doesn't feel right, contact your local Agent immediately. Hahahahahahahahaha. Remember that self proclaimed "retarded TEST shipbuilder" from last year. Thanks Savior, and thanks to all the Agents. The intention of this 3-day-old miner with the 40m Isk Retriever was clearly to deceive Agent Bellatrix Invicta. When our Good Agent proved too much for him, he descended into madness and incoherence. A lesson for all of us who deal with the carebears; don't believe a word they say. Wow. Someone really should tell that miner to calm down. Do carebears live in null or low sec space? It's hard to classify anyone as a "carebear" in low/null considering they are in a area where anyone can kill them at any moment with a minimal amount of annoyances like CONCORD, Faction Police, Station/Gate Guns, etc. That being said, you don't see nearly as much PVE in low as you do sov null (Most of my income comes from ratting in Deklein) - but it's kinda hard to call myself a "carebear" considering that at any moment the region could go hostile and a fight might be on my hands. and of course theirs are new form of "botting" its called ENOSING BOTTING" ppl can go afk all the time while taking "real sovereignity"
Proove yourself and take 2-5 systems lets see how long you could hold them? Miner, calm down. We control the only Sov that matters, Highsec. Confirming that I do indeed have tea with The Mittani while my timer is counting down. He likes loose leaf green tea. Who would have guessed?